Turkish President Recep Tayyip Erdogan pledged Thursday on receiving his Iranian counterpart Hassan Rouhani that Ankara would fully support Tehran against what he called “unjust US sanctions” against Iran. 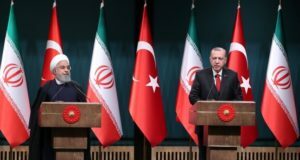 Erdogan held a joint press conference with the visiting Iranian President whose country has since August been under US sanctions following the rejection of the 2015 multinational nuclear accord by President Donald Trump. Following the first tranche of punitive measure, which targeted Iran’s banking sector, Washington last month imposed a second round of sanctions targeting Iran’s oil sector. Turkey, member of the NATO, is key buyer of Iranian oil and received a 180-day waiver to continue purchasing the Iranian commodity. Erdogan at the press conference stressed that the sanctions will lead to regional insecurity. “We will continue to be in solidarity with brotherly Iran at a time when pressures on Iran mounts which we find unjust,” he said. “There are so many steps that Turkey and Iran can take together to end the clashes in our region and ensure a peaceful environment,” he added. Both leaders indicated that the sanctions could be turned into opportunities. “This embargo can be both a threat and damage. It can both decrease our trade volume and limit our relations. However, we can make a good plan and transform these threats into opportunities,” Rouhani said. He urged Turkish businesspeople to invest in Iran’s energy sector vowing that Tehran will provide necessary facilities, substances, ports and regions. Both countries announced their intention to increase bilateral trade currently estimated at $11 billion to $30 billion. Posted by KanelkaTagba on Dec 21 2018. Filed under Headlines, World News. You can follow any responses to this entry through the RSS 2.0. Both comments and pings are currently closed.